Member since June 21 2012. We are a Colombian nonprofit founded in 1987 by the original team of authors that designed and developed the Escuela Nueva pedagogical model, worldwide renowned for its proven effectiveness improving the quality of education. We work mainly in low income public schools of developing countries and promote public-private partnerships. Our approach is systemic, cost effective and replicable; and it is build on the principles of active, participatory and cooperative learning. Through very concrete curricular and classroom strategies, experiential and effective teacher training, and community and administrative components, we work with students, teachers, administrators and the community to transform the conventional school and learning approach. Our business model is based on the sale of high quality products (proprietary educational materials for teachers and students) and technical assistance services (teacher trainings, workshops, consultancies), all designed around the Escuela Nueva methodology and principles. Most of our P&S are offered to public school systems (national, regional or local), either directly or though international and multilateral organizations; and, in some cases, through the private sector. 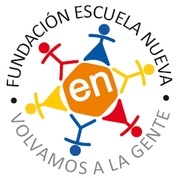 July 3, 18:19 Fundación Escuela Nueva At FEN we contribute to improve the quality, efficiency and sustainability of rural and urban basic education. We do so through the Escuela Nueva model, which we believe is a social innovation that provides a systemic, cost effective, replicable, and scalable solution to this problem.